I will dwell among them and walk among them, and I will be their God, and they will be My people. Therefore, come out from among them and be separate, says the Lord; do not touch any unclean thing, and I will welcome you. I will be a Father to you, and you will be sons and daughters to Me, says the Lord Almighty. 1 Cor. 6.14 KJV is often used as a warning by Christian parents to their dating-age children. 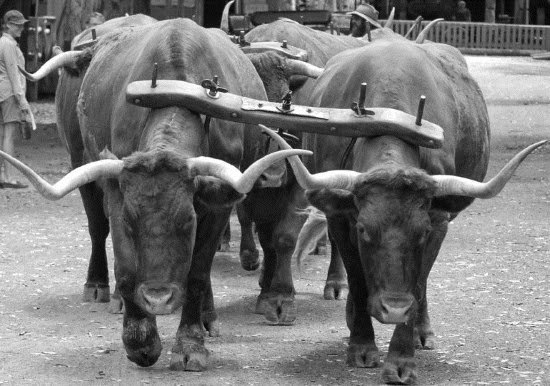 "Unequally yoked" yields quite a few illustrations, especially for people who are familiar with working the land (Deut. 22.10). The version at the top says "mismatched", another version says, "Do not be bound together with unbelievers". Most translations that I have found use "yoked". The caution against dating an unbeliever is very important because the idea of "missionary dating" is a violation of this admonition, and many Christians who married unbelievers have had serious long-term regrets, even to the point of living like unbelievers themselves. However, this passage is not only about marriage. It is about how Christians should be relating to unbelievers in general, and how closely involved we should become. We are not of this world (John 15.19-20, John 17.14), but that does not mean we have to isolate ourselves from unbelievers; I cannot insist that the utility companies are run by Bible-believing Christians, for example. Christians are to be careful with their associations with unbelievers, especially if we may be indicating that we condone their practices. You can do some research on this passage (John Gill's exposition should prove helpful as a starting point), but I need to apply the "mismatched" principle in a bit of a different direction. Should Christians work with unbelievers toward a common goal? There are many views on this, since it can be a gray area. I believe the main concern is if the common goal is spiritual in nature. Please note that this is not about doctrinal differences regarding nonessentials. I do not even know the views of other Admins at The Question Evolution Project regarding the continuation or cessation of the sign gifts of the Spirit, baptism by sprinkling or immersion, Calvinist or Arminian (I know of one Calvinist, and he does not harass me for not choosing either Calvinism or Arminianism), and so on. Also, I do not think any Admins espouse the baptismal regeneration heresy, which adds a ceremony to grace through faith (I actually pulled several articles from an apologetics group because they had a cultic mentality on this subject). Working toward a common goal of refuting evolution and upholding the authority of Scripture is our most important goal at TQEP. A bit of a side note, we have "Likes" and commenters who have views that are quite a bit different than mine. Should I run them off? Of course not (unless they blaspheme, mock and so forth). The following example is supposed to be true. I cannot document what I was told about it, but the illustration applies. Imagine an organization that is set up to show the truth about atheism, that it is an intellectually bankrupt worldview, and how atheist organizations are detrimental to religious freedoms. Sounds good so far. But what if the atheism-refuting organization is populated by liberal Christians, a Moslem and agnostics? They give information that touches on biblical things as well as logical and philosophical refutations of atheism. Personally, I think I would be supporting an organization that promotes views that are unbiblical. Would you support them? Here is another. A biblical creationist who has a high view of Scripture shares apologetics information from a site that may be good for individual articles, but the organization itself supports the magisterial view of science (that is, giving science supreme authority, and interpreting Scripture according to current science beliefs). In a similar circumstance, biblical "apologists" share material by arch-compromiser Hugh Ross, who actively ridicules creation science, or William Lane Craig, who also ridicules creationists and holds to the dubious theology of Molinism. Should a biblical creationist share such materials from people who are opposed to their views and have a lower regard for Scripture? A third possibility is when a supposedly biblical creationist Page on Facebook shares information from doubtful sources (such as Moslems, old earthers or Jehovah's Witnesses). When this is pointed out, the response is, "Yes, but they gave a good refutation of evolution". Should they be doing this? There are sites run by people who claim to be Christian, yet spend their time attacking biblical creationists. Atheists spend their time making comments on those sites, and the supposed Christian agrees with the way the atheists attack the Bible believers. Further, one site owner goes to atheist Pages on Facebook and further denigrates biblical creationists. Would you have doubts that this guy is even a Christian? For a final example, after I exposed a cult posing as a creationist Page, then another creationist Page came to their defense to attack both me and The Question Evolution Project. That Page has several Admins, but they were united in attacking us (so much for John 13.35). "We are just defending our buds page who is getting ruthlessly attacked for a stupid reason. Secondly, i have nothing to do with this as not all the admins of EFT are involved in this", whoever "i" happens to be (apparently not bothering to read the articles exposing the cultist and legalistic views). Their response is based on emotion, not on a rational defense or support of scriptural principles. Should a biblical creationist Admin continue with a Page that not only supports a cultist, but attacks people who honor Scripture? This comes down to discernment. Yes, I've been writing a great deal about that lately. Christians need to grow in the Word (2 Peter 3.18, 2 Tim. 2.15), knowing what and why we believe so we can contend for the faith (Jude 1.3, 2 Cor. 10.4-6) in submission to Christ. I personally cannot, and recommend against, using sources that are at odds with your own position, especially since there is a wealth of information from reliable sources. Also, I feel that I would be not only tacitly endorsing compromisers and false religions, but also confusing people by sharing that material. However, being too rigid in all of this becomes legalistic. Although I do not endorse the Intelligent Design movement because they generally reject biblical creationist principles, some creationists will use their materials to show irreducible complexity and refute naturalistic evolution. My feeling is that such things can be kept to a minimum, and with a caveat along the lines of, "This article contains good information, but we do not endorse the Suchand Soforth organization". In addition, if you share something from a news site with numerous authors, hopefully the people you pass it on to will have the good sense to realize that such a thing is usually self-contained; you're not endorsing the organization. Do not just take my word for things. Check what I say with the Word of God, think for yourselves (use that brain God gave you), pray — and be discerning. Do all to the glory of God, not for pride's sake or based on emotion.